Allah, the AVENGER breaks the tyrants’ backs and severely punishes those who are determined to commit sins; He gets revenge on the sinners by torturing them. Vengeance is the utmost degree of the exemplary punishment and chastisement. Allah, Glory be to Him, says, “For God is Exalted in Power, the Lord of Retribution” (IBRAHIM, 47), “Verily from those who transgress We shall exact due Retribution”(SAJDA, 22), “When at length they provoked Us, We exacted Retribution from them.” (ZUKHRUF, 55), “..for repetition God will exact from him the penalty.” (MA’IDA, 98). Vengeance is more severe than immediate punishment which doesnot enable the oppressive to indulge in disobedience or sins. Allah, The AVENGER, exacts retribution after giving respites, then He tortures the culprits and severely punishes the oppressive and this comes afterthreatening and warning them and after giving them all the means to repentance. Allah revenges from the highhanded tyrants only, He says, “..then, to those who transgressed We meted out Retribution.” (RUM, 47). 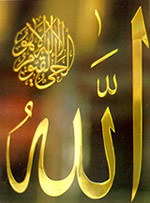 Glory be to the AVENGER, the Doer of all that He intends, Praise and Glory be to Him, He is Allah.